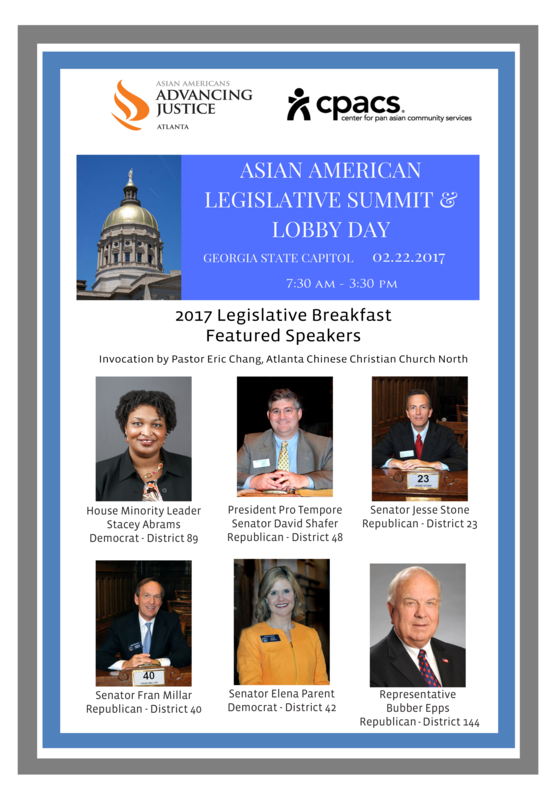 Annual Asian American Legislative Summit and Lobby Day is Tomorrow! We look forward to seeing you tomorrow morning, Wednesday, February 22, at 7:30 AM in the Freight Room of the Georgia Freight Depot to start our Legislative Summit and Lobby Day! Some helpful information is below. The Legislative Summit will begin with a breakfast session with featured legislator speakers and policy priorities at the Freight Room inside the Georgia Railroad Freight Depot (65 Martin Luther King Jr. Drive SE) in downtown Atlanta. The building is right next to the Capitol, and paid parking is available in front of the Freight Depot or in the Underground Atlanta parking garage. 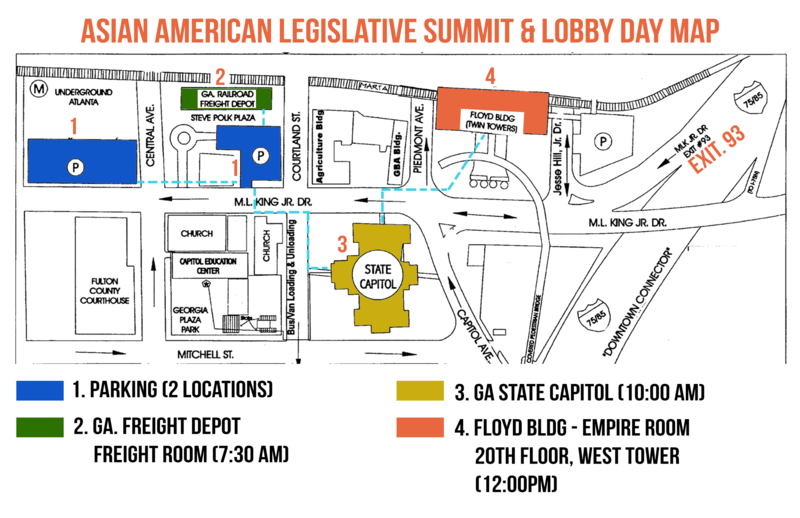 See below for the Summit and Lobby Day Map. Advancing Justice -Atlanta volunteers will be outside to help guide and assist you. We are expecting rain tomorrow. Please dress warmly and don't forget to bring an umbrella as we travel between the different buildings. We recommend that guests arrive by 7:15 AM as the program will begin promptly at 7:30 AM. Registration will be immediately inside the Freight Depot. Refreshments will be in the Freight Room. We will be able to take payment for unpaid tickets. Cash, checks, and credit cards are accepted. Checks should be made out to Asian Americans Advancing Justice - Atlanta. The formal program will start promptly at 7:30 AM. Elected officials, featured speakers, and dignitaries will be seated at special reserved tables. Guests of sponsors and individual ticket holders will be given open seating at the assigned tables. If you are staying for the Lobby Day portion of the summit, please be sure to select your lobby group based on issue area at the registration table. Colored stickers will be available to help designate groups. Volunteers will walk guests from breakfast to the Capitol for the Lobby Day portion. The group photo with Governor Deal will take place at 10:00 AM on the North Steps. Recognition of AAPI leaders on the House floor will happen during the Lobby Day portion. For those who plan to tour the Capitol and participate in Lobby Day, please don't forget to bring your photo ID with you. 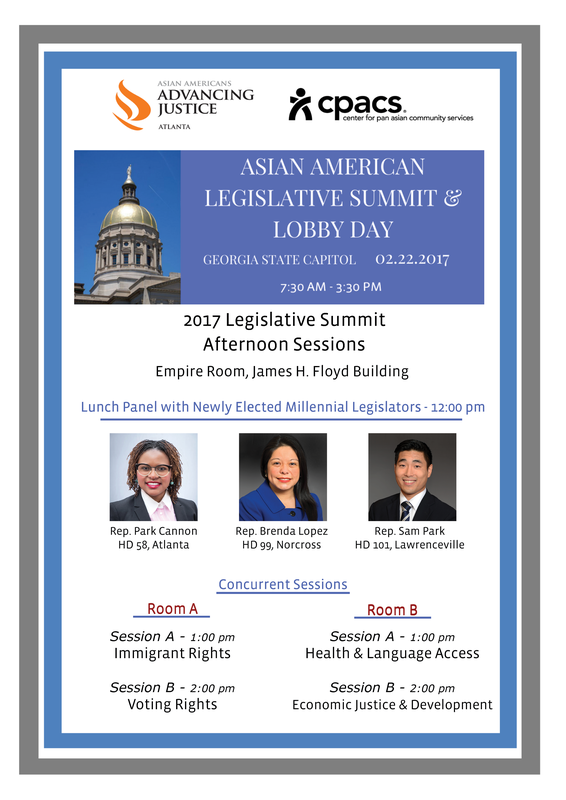 Lunch will be provided at noon in the Empire Room of the James H. Floyd Building (2 Martin Luther King Jr Dr SE, Atlanta, GA 30312), West Tower, 20th Floor) during the Lunch Panel with Newly Elected Millennial Legislators. 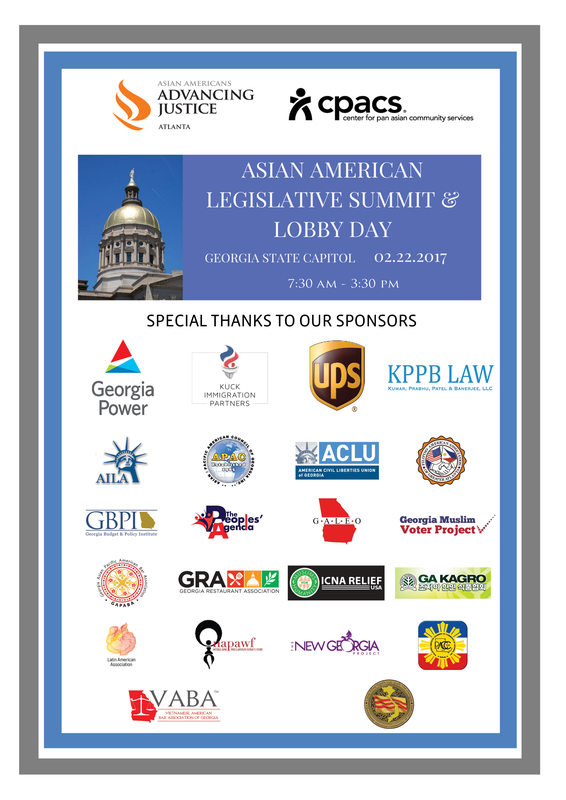 Copyright © *2017* Asian Americans Advancing Justice - Atlanta, All rights reserved.